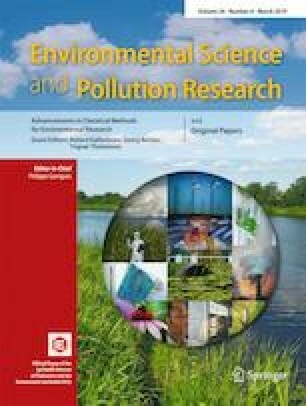 Environmental effects associated with the release of various metals even at maximum permissible concentrations (MPC) to the aquatic ecosystems are evident. In the present work, time-dependent increase in accumulated metals amount in gills of Anodonta cygnea after exposure to complex metal (Zn 0.1, Cu 0.01, Ni 0.01, Cr 0.01, Pb 0.005, and Cd 0.005 mg/L, MPC accepted for the inland waters in EU) mixture at various time points (1, 2, 4, 7, 14, and 28 days) was investigated. Statistically significant increase of Cu and Cd was determined in mussel’s gills after 7-day exposure, in comparison to control group; moreover, significantly elevated concentration of Cu was measured and after 14-day treatment (in comparison to control and pre-exposure group). Concentrations of five (Cu, Ni, Cr, Pb, and Cd) out of 6 investigated metals were statistically increased in gills tissue after 28-day treatment. Moreover, complex metal mixture has demonstrated tissue- and time-dependent genotoxicity (∑Gentox) and cytotoxicity (∑Cytox) responses in mussels. After 4-day exposure, there were found the highest ∑Gentox levels in gills cells and haemocytes. Two-day treatment of mussels resulted in the highest and statistically significant induction of ∑Cytox level (in gills). Furthermore, after short-term (4 days) exposure, statistically significant inhibition of AChE activity in hemolymph of metal mixture–exposed mussels, in comparison to control and pre-exposure group, was found. Comparison of investigated responses in different tissue of A. cygnea discloses new information about metal mixture (at MPC) impacts at different treatment time. According to the obtained geno- and cytotoxicity data, it is suggested that gills are more sensitive tissue. Environmentally relevant trace metal concentrations when existing in mixture are able to cause adverse effects in A. cygnea; therefore, biological effects at different levels of organism are expected as a realistic scenario. •Six-metal mixture at the maximum permissible concentrations is geno- and cytotoxic to A. cygnea. •The highest ∑Gentox levels in gills and haemocytes was determined after 4-day exposure. •Significantly highest induction of ∑Cytox level was found in gills after 2-day treatment. •Metal mixture possesses an inhibitory effect on the acetylcholinesterase activity in mussels. •Significant decrease in AChE activity in A. cygnea was found after short-term (4 days) exposure. •Significantly highest accumulation of trace metals has been determined after 28-day treatment. We are thankful to Gerda Petkutė and Greta Ašmenaitė for the help during this experiment. This study was funded by the Research Council of Lithuania through the project ACTIS S-MIP-17-10.